Considering its plentiful nature combined with cheap prices, natural gas has been a no brainer for utilities looking to fulfill seasonal power consumption needs. Now that winter is behind, the summer air conditioning season will be a major driver of buying pressure demand over the coming weeks, especially should average temperatures continue to rise across the lower 48 states. While one year performance of natural gas can be viewed as weak at best, returning -17.98% during the last 52-weeks, the energy product has endured a long running bear market. The most recent gains in prices are increasingly more convincing that a reversal may be in order. With El Niño this last year projected to give way to La Niña in the coming months, expectations are for a very cold winter that will help alleviate bloated stockpiles, helping reduced the inventory imbalance which remains at record highs. After hitting a seven-month high earlier in the week, natural gas prices have retreated modestly from recent gains in a sign that inventories and supply might continue to overwhelm demand despite seasonal factors contributing to increased power generation requirements. According to last week’s data from the Energy Information Administration, supplies remain above levels reported last year with production still outstripping demand. One of the reasons that the reversal in prices may not last is the properties of supply and demand that drive decision-making at energy producers. Should prices continue to rise over the near-term, producers that abandoned production over the last few years might be readily induced to restart production, adding back to the inventory glut that sent prices downward. Evidence of this comes from Baker Hughes which reported an additional 2 rigs being added for the week ending May 27th. With much more of available output operating on flexible terms and lower costs, restarting production is a much more reasonable for companies than in past years when equipment mobility and turnaround was a lengthier process. This factor may be a key offset to increased demand that is anticipated from utilities as they attempt to satisfy season energy demand what fluctuates wildly. Nevertheless, demand is climbing which might see prices spend more time trending sideways over the medium-term. Figures from the Department of Energy show that average power burn in 2016 has climbed 8.60% over levels reported during the same period in 2015. Even though the summer months are typically when the highest power burn levels are realized, should weather conditions match predictions, gas prices might have some further room to move higher over the longer-term despite potential medium-term pressure lower. Increased power generation demand may be a variable behind the stunning rally in natural gas prices, however, the commodity has been unable to overcome key resistance that has long stood in the way at $2.480 per MMBtu. Although prices managed to briefly move above the level, it has stood firmly in the way of further progress. 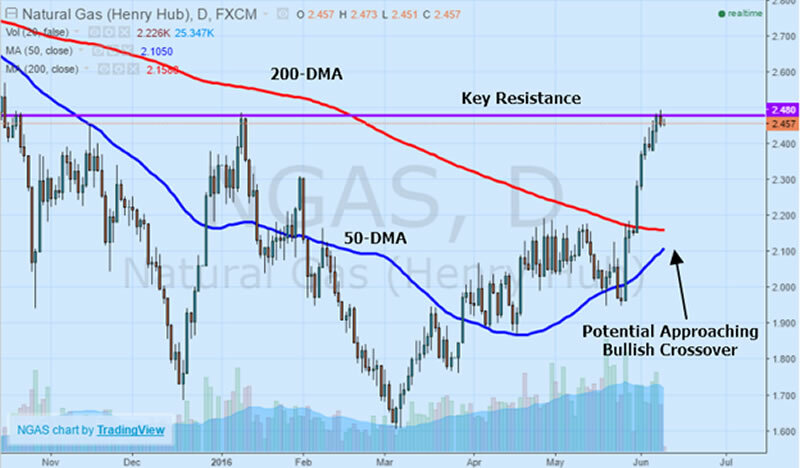 The current rally happened with such ferocity that natural gas rose above both the 50 and 200-day moving averages to the upside, with the 50-day approaching an upside crossover that would serve as an additional bullish signal. However, at the same time, the relative strength index is trending near overbought conditions, indicating a near-term technical correction before a resumption of the uptrend if it is set to remain intact. Based on the Fibonacci levels from the March lows to the most recent highs, a correction between $1.945-2.152 would be in-line with a traditional momentum pullback. Should the predictions about the La Niña weather pattern come to fruition, gas prices could rise further on the more extreme weather conditions that are expected to prevail. Aside from increased power generation to satisfy air conditioning demand, winter heating needs would also be anticipated to rise. However, rising prices might bring a recovery in production which has fallen as companies taken output offline, stymieing further upside appreciation. 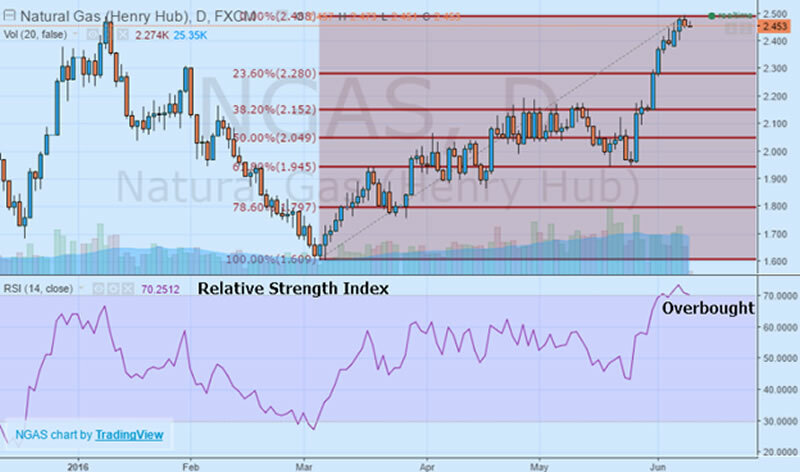 Instead, after a brief technical pullback, natural gas might find itself trending sideways over the medium-term as flexible production is brought back online to take advantage of the spectacular rise in prices. With this type of move helping to rebalance the supply-demand equilibrium, the recent surge higher in prices might be quickly deflated, causing prices to retreat short-term while staying steadier over the medium-term.